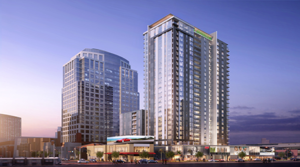 PHOENIX, Arizona – Hines, the international real estate firm, announced plans to build a 25-story, 379-unit luxury multifamily complex in downtown Phoenix. Located near Talking Stick Resort Arena, home of the Phoenix Suns, the development will be the firm’s first multifamily project in the Phoenix area. Hines has completed the purchase of a 1.5-acre site and received zoning approval from the City of Phoenix. Hines represented itself in the transaction and Jim Fijan at Fijan Advisors, LLC, represented the seller. Construction of the 480,000-square-foot building is expected to commence in the first quarter of 2019 and finish in the fourth quarter of 2020. The complex will be located on the Northwest corner of Jefferson and Third Streets near the Bank of America office tower (Collier Center), directly across from Talking Stick Resort Arena and near the light rail–ideal for residents who want to enjoy the downtown lifestyle. The multifamily complex is expected to have 75 studio, 179 one-bedroom and 125 two-bedroom residences. Three levels of underground parking currently exist at the site which will be used for resident parking. Hines will renovate 10,000-square-feet of existing office space and lease it.